Takes you to Kilimanjaro's true summit, Uhuru Peak and you can start your trek any day of the year! The Rongai Route is more scenic than the Marangu Route, easier than the Machame Route, and the success rate on the Rongai is very high. You can add an additional acclimatization day and make it a 7-day trek. The Rongai Route is more scenic than the Marangu Route, easier than the Machame Route, and the success rate on the Rongai is very high. Unlike the Marangu Route where you sleep in huts, on the Rongai you sleep in tents (tents are included), and the porters will pitch your tent for you. Meals are served in a dinner tent or on a blanket outside. 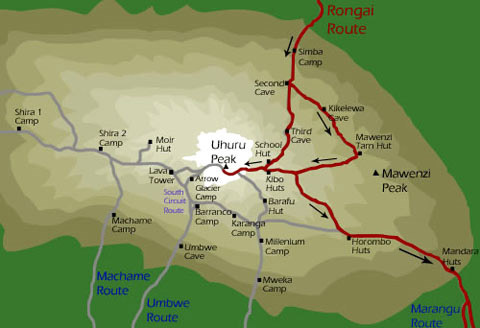 The Rongai starts on the north side of the mountain just south of the Kenyan border, and is one of the least traveled routes. The Rongai joins the Marangu for the summit climb, then you descend the Marangu Route on the mountain's southeast side, so you see Kilimanjaro from many view points. There are two versions of this trek – a direct 6-day itinerary, and a 7-day itinerary that takes a longer route. The more expedient 6-day itinerary is described below and the longer variation is described in the extra days section. Our day starts early with breakfast and a briefing. From Moshi we will travel via Land Rover through many villages and coffee plantations for 4-5 hours before arriving Nale Muru. After signing in and preparing the porters, we will begin the hike on a wide path winding through fields of maize and potatoes, then enter the pine forest. The forest begins to thin and Simba Camp is near the "First Cave" at the edge of the moorland zone with extensive views over the Kenyan plains. We will overnight at the Simba Camp. In the morning, we will embark on a steady ascent from the First Cave up to the Second Cave. En route, we will enjoy superb views of Kibo and the eastern ice fields on the crater rim. Today we will continue our steady ascent to the Third Cave. We should be careful to notice any signs of altitude sickness. Optional: Guests can add a day to this trek by taking a longer route that travels east to the Mawenzi Tarn, then crosses the saddle between Mawenzi and Kibo to rejoin the route at the Kibo Huts. This itinerary greatly helps with acclimatization, and increases chances of success. Today, we will hike from the Second Cave up to the Kibo Huts at the bottom of the Kibo crater wall. This is where we will join the popular Marangu Route to the summit climb the following day. Guests are encouraged to do their hike early in the day, prepare equipment and warm clothing, and rest in preparation for the summit climb tomorrow. We will wake at midnight to a light breakfast and prepare for the summit ascent! The goal is to climb before dawn so that we can reach Uhuru Peak shortly after sunrise. We will leave at 1:00 AM, switchback up steep scree or possibly snow, and reach Gilman's Point between 5:00AM and 7:00AM. Another 2 hours of hiking along the crater rim near the celebrated snows takes us to Kilimanjaro's true summit, Uhuru Peak, by 9 AM. This is Africa's highest point! After the summit stay, we will descend back to the Kibo Huts, have lunch, rest, and return to the Horombo Huts for dinner and some well-deserved sleep! NOTE: We will do the beginning of this climb in the dark with headlamps or flashlights. It will be very cold and guests you will need all of their warm layers. This is, by far, the most difficult part of the trek. Slow and steady, or, "pole pole," and an optimistic attitude will get guests to the summit peak! Today we will descend through the moorland to the Mandara Huts, have lunch, and then continue their triumphant recessional down through lush forest to the park gate between 2:00PM or 3:00PM. We are encouraged to Remember to tip their guides, cooks, and porters before leaving. A vehicle will transport us back to their hotel in Moshi.